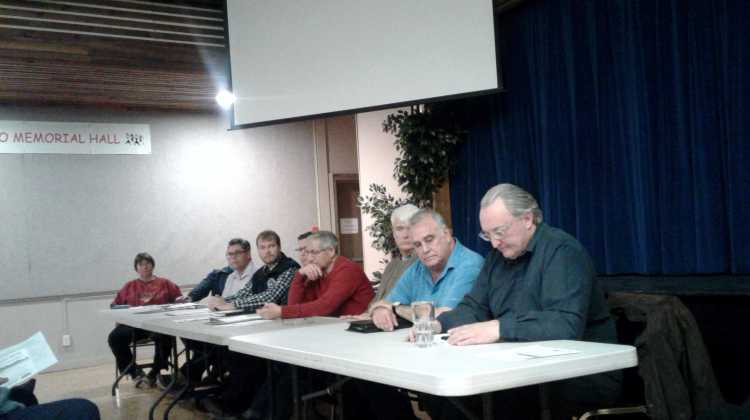 On January 22 a group of government and community representatives met at Sorrento Memorial Hall to share information about issues in Newsome Creek. 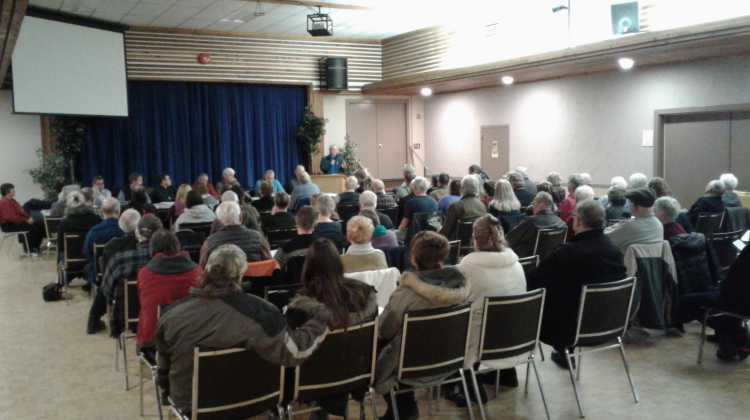 Ten speakers and 81 community members explored what’s happening with Sorrento’s water system, plans to fix the culverts up and down the creek, effects of the wlid fire in 2009, and re-forestation. Newsome Creek representatives opened the program with a slide show documenting problems in the creek from property damage, to road washouts and water contamination. Changes after the fires of 2009 were cited, especially the quick snow melt in 2011 which released large amounts of run off that carved new stream beds and significantly altered the waters ways at the base of the mountain. The events of 2017 and 2018 were highlighted, including extreme slope erosion below Highway 1, and large gravel erosion in the stream bed at various locations on Notch Hill. Above are some of the pictures used in the presentation. Below is a stylized map to help locate the crossings. Click map to enlarge. Terry Langlois, Team Leader of Utilities at the CSRD, gave an overview of the Sorrento Water System. The Markwart Water Intake is located 520 metres off shore at a depth of 23 metres, and the pipe is about 10 inches in diameter (300mm). At 23 metres deep the lake water is cooler and more stable, therefore it’s cleaner and better suited for the intake and pumping equipment. In this part of Shuswap Lake there is a current moving west to east, which has been confirmed in a study by Larratt Aqatic Consulting done in 2015; Source Assessment of the Sorrento Shuswap Lake Drinking Water Intake. It’s this current that pulls silt from the mouth of Newsome Creek 550 metres to the intake. While this may seem like a long way from shore, water results in the Spring freshet have indicated an undeniable correlation between outflows from the Newsome Creek and turbidity in Sorrento’s water supply. FYI: CSRD measures turbidity on a scale of 0 to 10 using an instrument called a nephelometer which uses a detector set up to the side of a light beam. If there are lots of particles in the water the light will bounce off the particles and the sensor will detect the scattered light beams. Fewer particles will trigger lower readings. The units of turbidity from a calibrated nephelometer are called Nephelometric Turbidity Units (NTU). More info on turbidity and NTUs. Normally Sorrento’s water reads 0.2 NTU, and it’s not uncommon to rise to 0.8 in a freshet. A Water Quality Advisory is posted at 1, and a Boil Water Advisory is posted at 5. In the freshets of 2017 and 2018 the readings were 10, and they would have been significantly higher but the nephelometer only goes to 10. In 2017 and 2018 Sorrento had Boil Water Advisories that lasted four to six weeks, which is highly irregular. Most Boil Water Advisories in the Shuswap are one, maybe two weeks. In a follow up conversation with Mr. Langlois he added that turbidity makes it difficult to treat water because the turbidity can act like a curtain around harmful bacteria. Sorrento’s water is treated first by ultra violet rays, then by chlorination. The UV rays kill off bacteria in the water, but too much silt shields the bacteria from the rays. 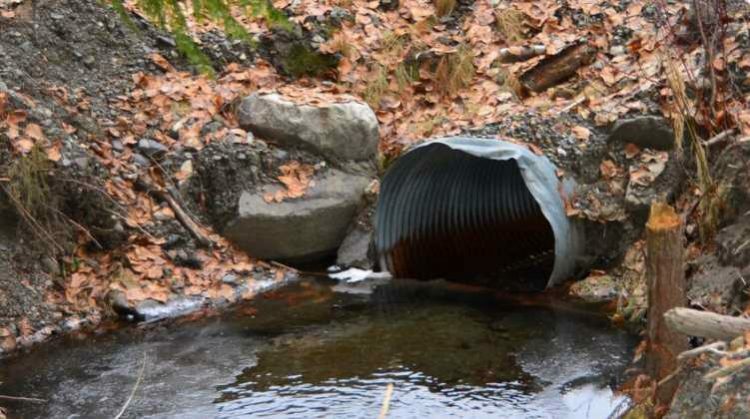 Operations Manager Danny Morris stated that MoTI’s long term plans include looking at all the culverts from the top of Notch Hill down to Dieppe Road at the lake. Requisitions are in process for Highway 1 and Dieppe Road, and work has already begun at the Highway 1 (TCH). Surveyors have been working up and down the creek throughout January assessing the crossings and culverts. It’s unclear at this point how many of the other crossings are in the funding stream. Mr. Morris noted that MoTI must make the TCH culvert (and all others) compatible with regulations for fish bearing streams since DFO has classified Newsome Creek as such. Discussion came up around whether there are fish in the creek, but MoTI must follow DFO’s direction on this. As a result it will take some special effort to get the TCH culvert situated properly to allow fish to navigate the waterway. 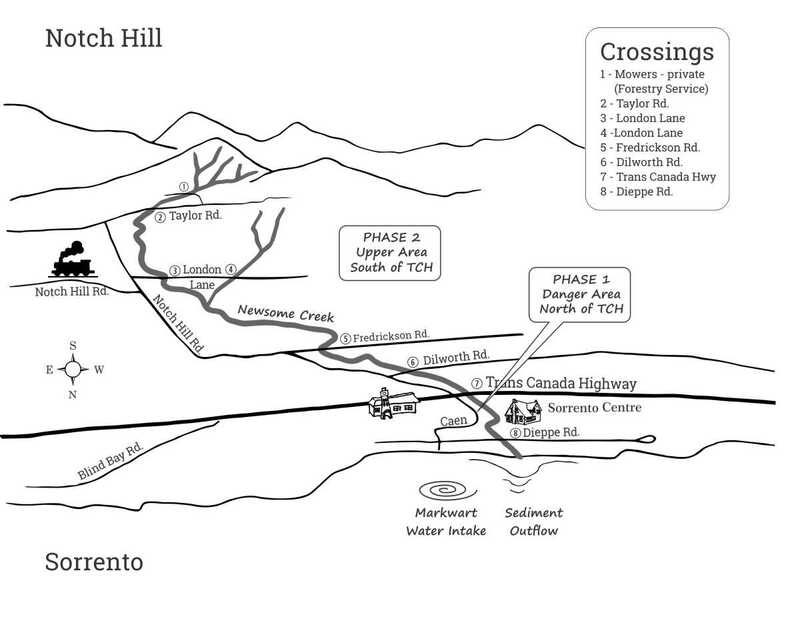 Mr. Morris added that MoTI have done hydrology studies they will contribute to the Mitigation Work Plan below the TCH. 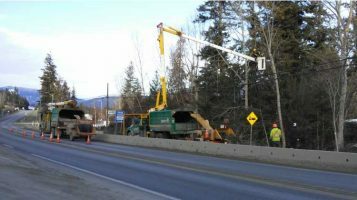 MoTI will work with engineers to ensure there is a stable transition from the culvert into the stream bed below the TCH where homes have been impacted by fast flowing water in the Spring freshet. Steve Schell, Senior Project Manager, gave an overview of floods in the southern part of BC in 2018, as well as statistics regarding the wildfire area in 2009. He stated FLNRO will support any Section 11 applications to help speed up work on the creek. A Section 11 application is submitted to the Department of Fisheries and Oceans when work needs to be done in riparian areas. DFO has strict guidelines around tree removal and what can be done in and around streams. Trevor Bohay, Section Head of Regional Water Management, added that Section 11 applications can take a long time, so expediting this process could prove helpful when the Mitigation Work gets started below Highway 1. Mr. Bohay also spoke of a sediment settling pond but details were sparse and working with MoTI on culverts is a bigger priority at this point. Also, in the Question Period Mr. Schell recommended applying to the Forest Enhancement Society of BC for help with reforestation efforts. Again he offered to work with NCWAG by supporting any grant applications made to FESBC, or any other appropriate funding application. This kind of support from FLNRO will add a lot of value when applications are submitted to funding bodies. PHASE 1 funding was covered by both Area C Director Paul Demenok, and Derek Sutherland, Team Leader of Protective Services. PHASE 1 addresses the area below Highway 1 where homes and businesses are at risk, and there’s danger to personal safety around the creek. PHASE 1, Part 1- Emergency Managemnet BC and CSRD are each contributing 50% of the cost for engineers to come up with a Mitigation Work Plan, up to a total $50,000. This step is complete as the funding for the study has been secured. PHASE 1, Part 2 – Engineers are using the funding to produce the Mitigation Work Plan. Hopefully the plan will be completed by mid-April. PHASE 1, Part 3 – CSRD will secure funds to execute the Mitigation Work Plan. In other words, once we have a plan, we’ll need money to pay for the work itself. CSRD has their eye on a couple of funding sources. They’ll be writing grant applications as soon as the plan is complete and the estimated cost of the work is known. In the Question Period people were able to get clarification on specific points, but ultimately conversation shifted toward re-forestation. There seemed to be a strong desire to re-plant as much of the burned area as possible. Since re-forestation wasn’t on the agenda this seemed like the beginning of a bigger conversation, and an area to explore in the future. At the end of the meeting Mark Hemmingson thanked community members for coming out, and went over some ways to get involved. You’ll find reports, letters and documents that outline the issues in the watershed. We update the site regularly as developments occur. When you’re on the website you’ll be able to sign up for the newsletter. We send eNews once a month, or when there’s important information to share. It’s a quick read, and it’ll help you stay in touch. To help pay for various expenses such as the website, newsletter, printing of posters and pamphlets, mail outs, and other sundry items. This is a grass roots community issue that will benefit from grass roots conversation. We’re looking for creative, collaborative ideas to help move things forward. We meet every couple of weeks at Sorrento Centre to discuss problems and find practical solutions. You can always find our Next Meeting date on our the home page of our website.